Product prices and availability are accurate as of 2019-04-13 12:25:43 UTC and are subject to change. Any price and availability information displayed on http://www.amazon.com/ at the time of purchase will apply to the purchase of this product. Medium gauge construction for use on lids, table leaves, and cabinet doors. Made of .040 gauge material with a .100 pin diameter. 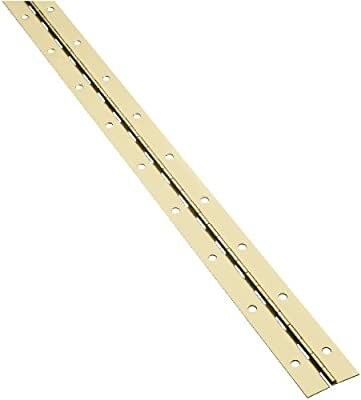 2" hole spacing with countersinks for 4 x 1/2 flat wood screws included. The Stanley Hardware 1-1/2-by-30-inch medium-gauge steel continuous hinge is perfect for use on lids, table leaves and cabinet doors. Made of .04-inch gauge material with a .1-inch pin diameter, the continuous hinge features 2-inch hole spacing with countersinks for 4-by-1/2-inch flat head wood screws. This hinge is bright brass-plated with a steel base. Screws are included.